A superior example of a Comte made to a traditional method, giving a complex and fruity cheese with a supple texture. 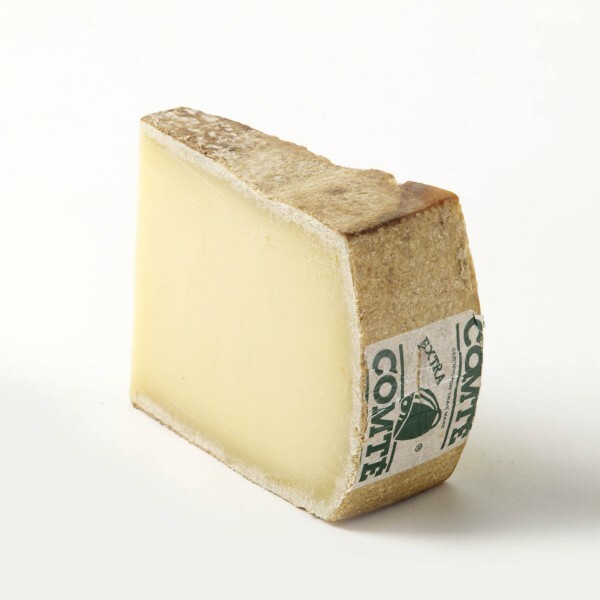 Comte is made in the Jura Mountains on the French side of the Swiss / French border. It is from the Gruyere family and is fairly similar to Gruyere itself, although lighter in character with more complexity and finesse. It is made using the raw milk from Montbeliarde and French Simmentale cows which are fed exclusively on grass and hay, with fermented fodder being banned. Comte was originally made as a way of storing milk during the long, harsh winter, and was made large enough to be sufficient for a whole family's use for this time. A lot of milk is needed to make each 30-48kg cheese, on average about 500 litres therefore the farmers unite to form co-operatives. The flora of the Jura region plays a crucial part in the character of this cheese, with the abundance of beautiful flowers and grasses giving a rich complexity to the flavour. This can be particularly noticeable in the Alpage cheeses which are made only in the summer months in dairies which are above the winter snow line. In winter, the cows descend into the valley and if cheese is made at all, it is in the laiteries - village dairies. Once made by the co-operatives, the Comtes are sold to affineurs who have caves designed for optimum storage and are exceptionally skilled at maturing these cheeses. Paxton & Whitfield Comte comes from the cheeses set aside by the Fromagerie Androuet from world-renowned Affineur Marcel Petite whose family have been maturing Comte for five generations. Comte is a cooked, pressed cheese that is covered with a rind which protects the interior throughout its maturation. The colour varies from golden yellow to brown depending upon the conditions of the cellar in which it is matured. It is a cheese with a Protected Designation of Origin (PDO) which amongst other things signifies that it has to be made with raw milk from the regional cows fed on the pastures of the Jura Mountains, colourings and additives are prohibited, and has to be matured for at least four months. Winter Comte is pale in colour due to the lack of natural vegetable colouring, Carotene, in the cows' diet during this season. It is frequently described as having nutty, earthy and roasted flavours, while the darker, more golden coloured summer cheeses are floral and fruity with a distinct richness. Both of these, however, have the common characteristics of saltiness and sweetness with a mild acidity. Each batch of Comte has to be assessed for quality and awarded a score out of 20. If a cheese scores below 12 it cannot be sold as Comte, and if scoring between 12 and 15, is covered with a brown label which signifies a slight default in either the texture or the taste. Cheeses scoring above 15 receive a green band are considered to be the best - Paxton & Whitfield Comte has a green band. Our Cote de Duras Red is a perfect match for Comte Androuet.